I rarely post OOTDs lately... so here, have eight! 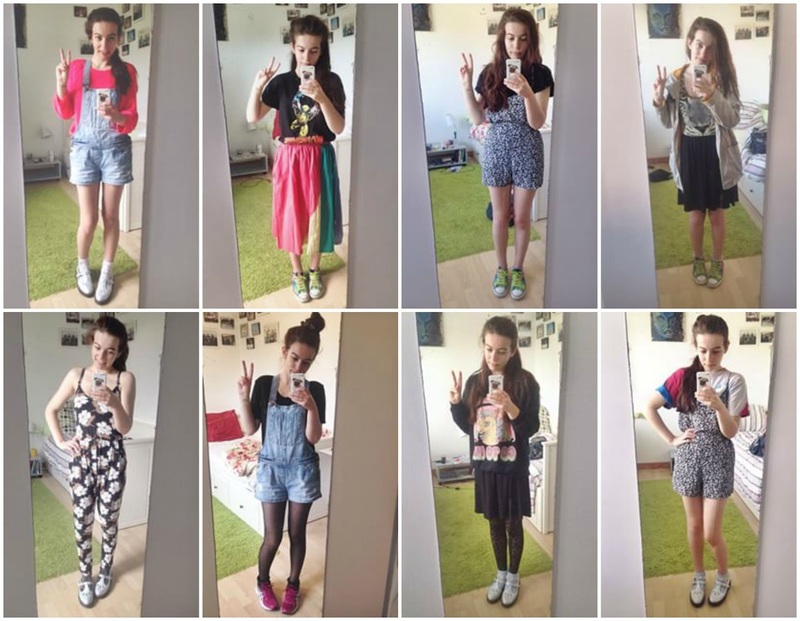 A rather compact view of some of the outfits I wore in France. I just couldn't get used to the weather! And occasionally working in a super cold lab while it was sticky hot outside made it hard to choose what to wear. I thought I'd only brought reeeeallly summery things, but not summery enough it seems! I had to go out and buy shorts! And two vintage skirts (actually I wanted to buy them) one of which I'm wearing in the top left photo, the bright block colour midi-skirt. I never thought a midi-skirt could suit me, but a high-waist saved me again! I wore the floral playsuit a lot, I'm sure I also wore it with tights at some point over the summer, not always bare legged like in these photos. I also wore tights with my denim dungarees, and wore either my silver t-bars, pink runners, or my tie-dye vintage converse (cool points for me). My full length jumpsuit was a saviour for labs! It was light enough to keep me cool outside, but covered my legs and then my lab coat would cover my arms to protect me from the cold air conditioning in certain labs. And obvs there's that one all black outfit that sneaked in. I know I ought to be posting about 'fall trends' but I basically wear the same things, only with more layers and socks... does your style change much with the seasons or not? Theme images by hdoddema. Powered by Blogger.